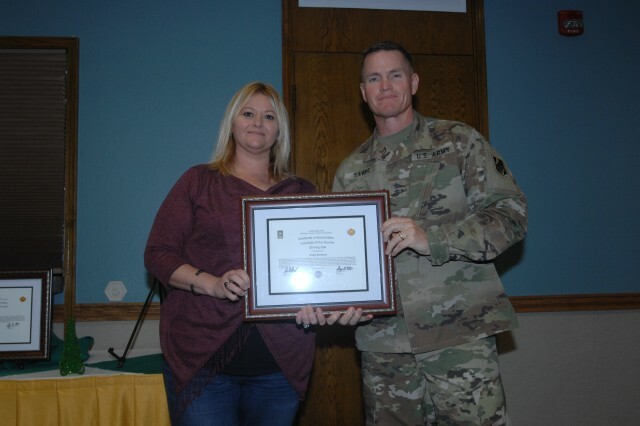 The Fort Leonard Wood Army Volunteer Corps honored the installation's Volunteers of the Quarter at the Community Information Forum Nov. 29. Tina Predmore, an Army Community Service mobilization and deployment specialist who narrated the ceremony, said the award ceremony gives the installation the opportunity to recognize the efforts of all volunteers who contribute to the community. "Through recognition, compassion, appreciation and commitment, the installation can maintain a healthy volunteer program, she said. Volunteer of the Quarter "military"
Sgt. 1st Class Leonard Lawrence, Company B, 1st Battalion, 48th Infantry, was honored for contributing more than 65 volunteer hours at the Missouri Civil Air Patrol and the Company B, 1st Battalion, 48th Infantry Family Readiness Group. Volunteer of the Quarter "retiree"
Casey Morris Jr. received the Volunteer of the Quarter "retiree" award. Morris retired from the Air Force June 1990 and from civil service in 2011. He has been working with Boy Scouts of America for the past 16 years as a cub master and a scout master. He is currently a unit commissioner and the district advancement chair for the River Trails District. He is the chairperson for the St. Nick's Benefit program on Fort Leonard Wood. "His involvement in Scouting and our youth in the past 16 years has had a positive effect on thousands of youth and their Families," Predmore said. Volunteer of the Quarter "youth"
Samuel Main received the Volunteer of the Quarter "youth" award. Main volunteered with the Fort Leonard Wood Chapel Youth Program. "Through his volunteer work he reaches more than 200 children, youth and parents. 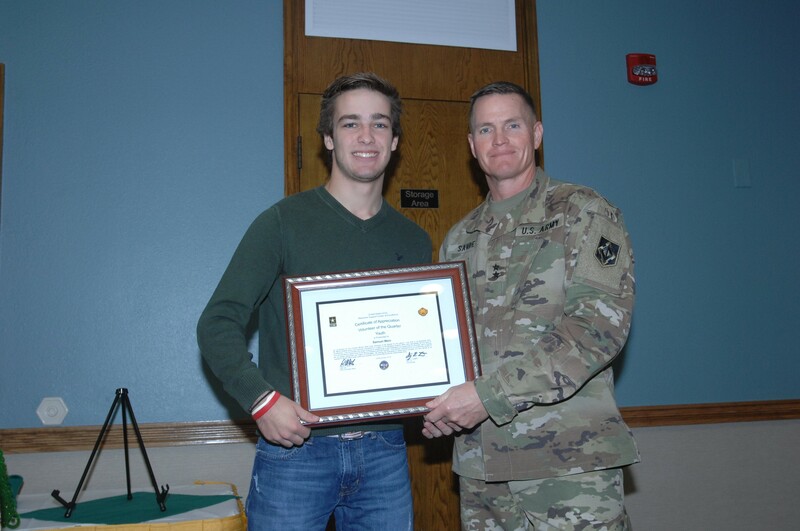 Displaying enthusiasm, commitment, and responsibility, Samuel will continue to achieve and give back to those who serve," Predmore said. Angie Donahue received the Family Readiness Group Shining Star award. Donahue volunteers with the Company A, 3rd Battalion, 10th Infantry FRG. "Angie is always first to help and last to complain about the hard work and long hours," Predmore said. Volunteer of the Quarter "civilian"
Joseph Krill Jr. received the Volunteer of the Quarter "civilian." Krill contributed more than 150 volunteer hours during the quarter at the Fort Leonard Wood Thrift Shop. "His responsibility for different projects doesn't end with the thrift shop, he also serves many other Fort Leonard Wood community programs," Hutsell said. "His enjoyment from his volunteer activities and his enthusiasm is always an inspiration to others. Joe's positive attitude has inspired others to volunteer. His ability to lead and complete tasks make him a valuable asset." 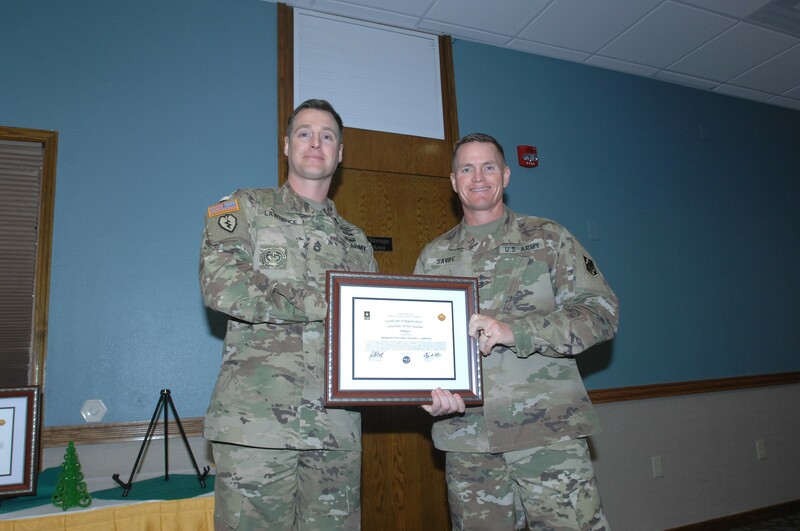 Volunteer of the Quarter "Family"
Chaplain (Capt.) Jonathan Porter, wife Valorie and their children received the Volunteer of the Quarter "Family" award. The Family is actively involved in Family ministry, Wednesday Night Live and children's church. "During Vacation Bible School, the Porter Family provided support making costumes, scenery, writing scripts, making props and stalagmites. They lead by example with a servant's spirit and a joyful heart. Their caring abilities help to strengthen individual, Families and spiritual fitness," Hutsell said. 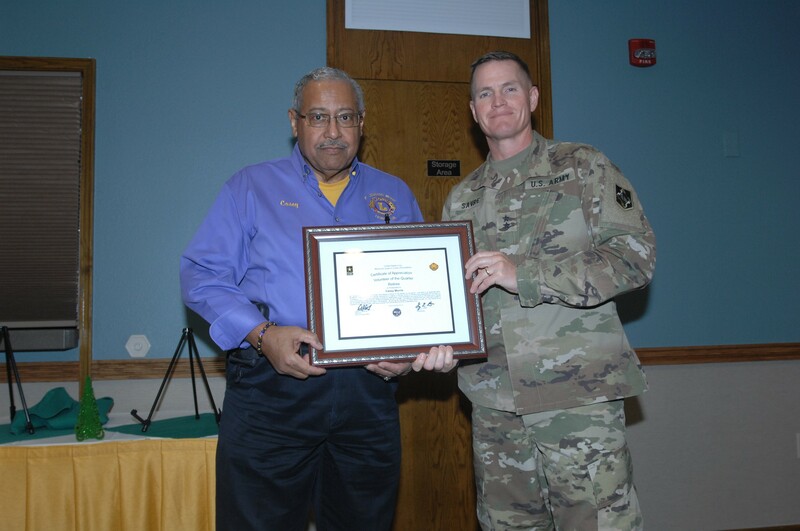 Hutsell said Fort Leonard Wood relies on volunteers to help support the programs contributing to the well-being of military members, retirees, Families and civilians. "Volunteers are valuable, they bring great gratitude and attitude," Hutsell said. "They are continually contributing their time, talent, skills and energy to sustain the mission." For more information on the Fort Leonard Wood Volunteer program, contact Hutsell at 573.596.0131, ext. 60212.